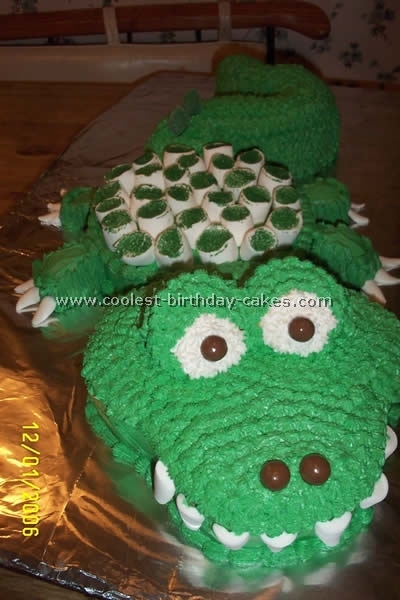 For this alligator cake I began by mixing and baking one sheet cake and two 8" rounds. I refrigerated them over night. I leveled the two rounds with a cake leveler and spread a strawberry filling in the middle. Next I sculpted the gator head from the sheet cake. I cut an oval shape and cut one end straight. Then I cut two humps for the eyes and placed them on either side of the head. I cut a little sloped wedge to place between the gators eyes. Then I cut two smaller humps to form the nostrils and placed them at the tip of the snout. 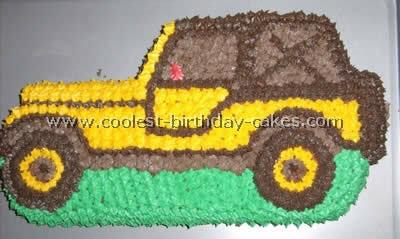 For decoration I would use the Wilton ready to use icing as it easier to use and tastes delicious. I used Wilton colors to tint the icing. I decorated with Wilton tips #18 & #5. 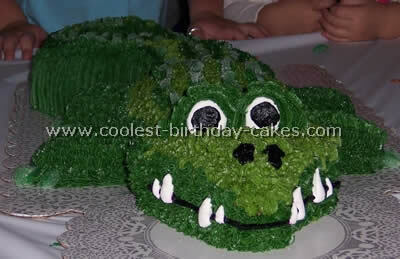 I took ideas from another alligator cake but I changed a few things. First I cut the shape of a head from a small oval cake pan. Then I used the bunt cake pan for body but shortened on piece for the tail. I used mini round cake pans (larger than cupcake size) cut in half for the feet. I used two colors of buttercream frosting in greens for authenticity. I used Brachs green fruit slices for the spikes and claws because I couldn’t get spearmint leaves. I cut these into sections for the spikes and feet. I also used marshmallows for the eyes. This cake was orange flavored (using orange extract in a yellow cake mix) and I used an Oreo cookie and Jell-o instant pudding for the filling. I just added less milk to the recipe. This alligator cake was a total hit and my favorite accomplishment of cake decorating so far! 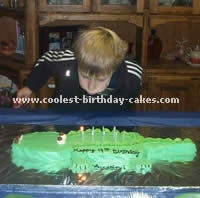 A love of the Crocodile Hunter – Steve Irwin led to my three year old demanding a crocodile cake! 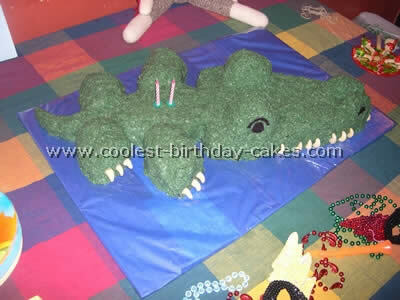 Not sure what to do I searched the internet for a crocodile or alligator cake, hoping to make it more feminine. We threw in Captain Hooks hook, some pirate money and Tinkerbell. The body of the alligator cake is a large sponge roll and the legs and feet four mini sponge rolls. 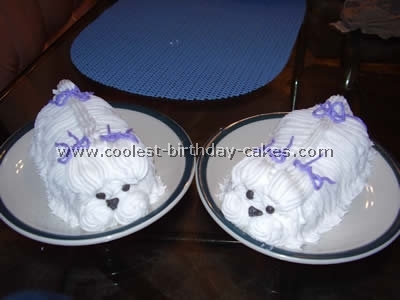 Another two mini sponge rolls were trimmed to make the tail and the head was a homemade butter cake trimmed to shape. Once the basic body was attained the cake was covered in fondant icing tinted green. The scales were made using the same fondant but with a black tint swirled through. Licorice rounds formed the eyes and the teeth are a strip of white fondant in which the jagged teeth are indented in a zigzag format. My daughter actually had a shared birthday party (and cake) with another child – a boy who also turned four and he was blown away by his crocodile cake too. I doubt he even noticed Tinkerbell sitting on one side. We were having a reptile party at our house. A reptile company came in with several live reptiles so naturally I needed to come up with a themed cake. I made this alligator cake by using three pans. The head is actually a pan in the shape of ballet slippers. The body is an Easter egg and the tail and legs were made by cutting up a 9×9 square pan. I played with various greens and browns to get the right colour of swamp green then used a black edible spray and piped the grid on his back to complete the look. For the teeth I used fruit gummies that I cut up and used the white backing only. I baked the alligator cake in a 13 x 9 inch pan using a traditional white cake box mix, drew a sketch of the Crocodile and cut the cake into the pieces based off the sketch. I added green food coloring to cream cheese frosting and used marshmallows for the eyes and teeth. My son loves alligators so I decided to have a jungle theme party for his 2nd birthday. I had 15 adults to feed and three children (from 2-4 years old). The tail of the alligator cake is a bundt cake cut into 3 sections. The body of the alligator is two – 9in rounds, the head is a square pan that was cut into a triangle and the legs and eyes are cupcakes. I trimmed here and there to round things out on the head and filled in the gaps with the cut pieces. I put cream cheese icing in the middle layers of the body and tail. I used plain vanilla icing with food coloring for the rest. I recommend using butter cream though, and maybe the jells to get more realistic coloring. The claws are marshmallows and the eyes and nose are jelly beans. This cake was pretty easy and was a total hit. My son and guests loved it. My son loves Alligators. So for his two year birthday party I decided to go with a Zydeco theme (since his birthday falls so close to Fat Tuesday). I, being a health food nut, am always trying to make healthy baked goods staying away from sugar refined white flour food coloring etc. 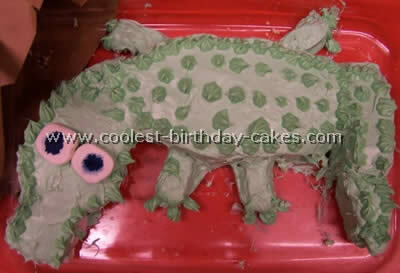 So I came up with this alligator cake idea. I used organic chocolate cake mix from the health food store. One cake went into a bundt pan and the other cake went into a rectangle cake pan. I cut a triangular shaped head out of the rectangle not coming to a sharp point at the tip but a squared off triangle. The pieces that were left were smaller triangle shapes. I put these together to form the body. I took the bunt cake and cut it in half. Off one half, I cut about a 2-21/2 inch piece off of each end for the raised up eyes. Then I cut off another 1-1 1/2 inch piece off of both ends for the nostrils. Then I cut both of the halves of the bunt cake in half for the 4 legs. Now for the fun part…the icing. 3 cups coconut flakes, 1 stick butter room temp, 3/4 cup milk, 1 1/2 tsp vanilla, 6 tbs maple syrup, 1/2 cup – 3/4 cup coconut oil room temp, and 1-2 tsp. (or however green you want it) of spirulina (blue green algae)or barley grass for the green coloring. Mix together and refrigerate. The mixture will get harder the longer you refrigerate so when you go to frost let it get to room temp. Frost with a spatula. 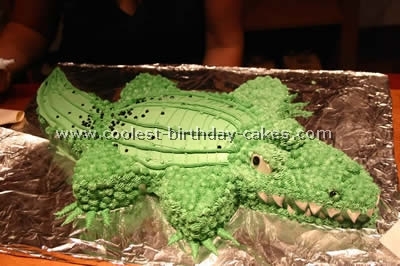 For the alligator cake tail I just built up icing to form. For the teeth and claws I used whole raw cashews. For the eyes and nostrils I cut out pieces from a grape fruit leather. Bon a Petit! And that’s the Zydeco Gator Cake! 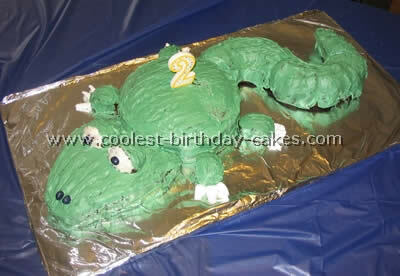 The body of the alligator cake is made of a bunt cake cut into three pieces. The head is a round cake pan cut. The feet and tail are also cut from a round cake pan. 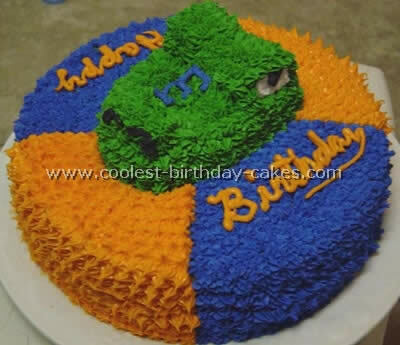 Always freeze the cake (especially if you use a super moist mix) this will make it easier to manipulate. Cut it frozen and ice it immediately. The more frozen your cake is the less crumbs you will have. The eyes and teeth are marshmallows rolled out with a rolling pin. The spines claws and nostrils (and pupils) are rolled out gumdrops. I use super moist mixes and canned icing. I made this alligator cake for my son’s 4th birthday. It was really simple to make. I used 2 boxes of cake mix to prepare the cake. Using two 8" round cake pans and one 4" round pans. I sliced each round cake in half and using frosting tinted green as glue to adhere three of the halves together and placed them cut side down to form the arch. 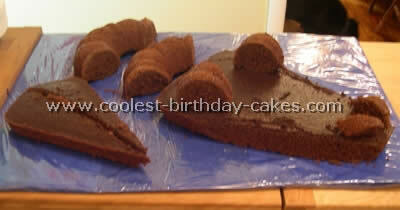 Then I cut the smaller cake in half and repeated the process to form the head. I then cut a wedge out of the smaller halves to use as feet. The eyes, teeth and body were then decorated with marshmallows. Steve Irwin was and still is my son’s hero. So after watching his memorial he decided he wanted a Steve Irwin party. 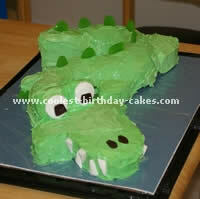 Silly me asked him if he wanted me to make him a crocodile – alligator cake. Of course he did. I ended up using a heart pan for the head and used a Glad baking pan for the body. For the tail and feet I used a loaf pan and cut it in half depth way then with the bottom part I cut for the tail and the other part I made into feet. 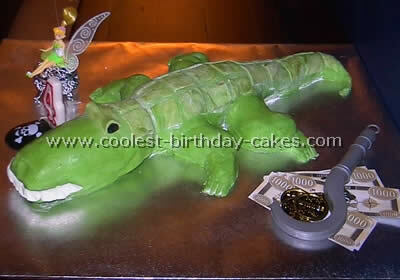 Then I frosted the alligator cake green. That was kind of tricky. I used a zip bag and put a blob of frosting for the eyes and added whoppers candy. I also used whoppers for the nostrils and sour rings cut in half. I also used the sour rings for ridges on the back. I used a tube of black gel for the claws and of course to write on the cake. Even I was impressed at how cute it was. My son was so excited and the cake received a lot of ooo’s and aaahhh’s. 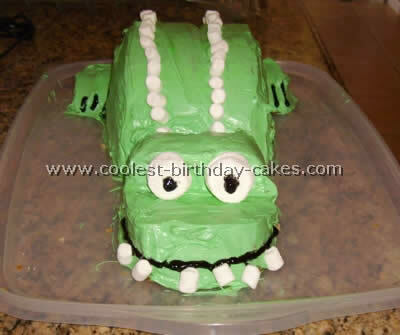 My son is obsessed with alligators so for his 3rd birthday I came to the coolest birthday cakes website and found some really great ideas for an alligator cake (you can even see the printout I was using in picture #1!) I tweaked this one a little and the results were fantastic. I used 2 boxed cake mixes. I baked one box into two 8" round pans and one into a 9X13" pan. The body is one of the round cakes. I quartered the other one for each of the legs and the head and tail were shaped from the 9 X 13" pan. I used Swiss butter cream frosting (from Martha Stewart) which made it so easy to work with. The eyes are marshmallows and I used scissors to cut teeth from marshmallows as well. You just snip the sides at an angle and viola! Teeth! The black for the eyes and "bumps" is a gel frosting. I used a star tip for most of the decorating. The toes are just frosting as well as the nostrils. 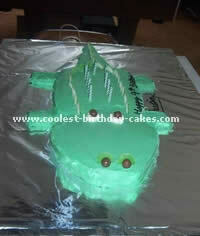 Everyone loved this alligator cake! 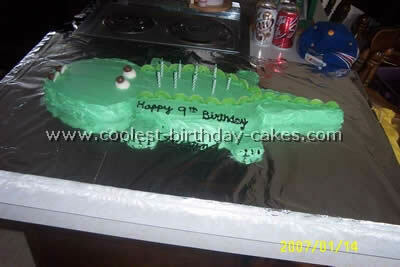 This is a very BIG Croc cake. My Grandson Dante loves crocs. 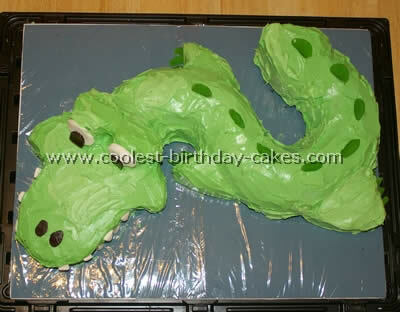 I got the idea from your web site for an alligator cake but changed it up a little. I used a Strawberry Shortcake pan (upside down) for the head, shaped it up a bit, 9 in. round for the middle and a bundt cake for the tail. I baked 6 cupcakes for legs and eyes. Malted milk balls for the eyes and nose. I cut the tops off of large marshmallows and dipped them in green sugar. 3 cake mixes (head body legs – white) (tail – chocolate) Snipped marshmallows to make teeth and toe nails. Cut bundt cake in 3 pieces. Form tail. Sugared spearmint leaves to stick in tail. Dante had a "Jungle" party theme.